North America’s only marsupial, opossums, who resemble giant rats because they too have pointed snouts and tails that are long, naked, and skinny. They are omnivores which mean they eat anything from mice, insects, worms, snakes, birds, and chickens to fruit, nuts, and grass. Opossums can cause severe damage to homes while scavenging for food and looking for a safe, warm place to give birth to their young. Opossums usually invade homes when a female is looking for a den before giving birth. If they find a den site inside your home, they will often use it over and over to raise and feed their young. If an opossum gets in to your attic, they will cause damage to your air ducts and insulation. The waste they leave behind will be substantial, as they go to the bathroom frequently and throughout the entire attic space where they are living. Since opossums are omnivores, they will destroy any fruits, veggies, and plants growing in your yard. They will also search for food by rummaging through trash cans or steal from pet dishes left outside. Getting rid of hiding and nesting places. Make sure to keep your grass cut short and your shrubbery trimmed. Cut branches that are overgrown and clean up any dead vegetation, ensure there are no holes or gaps underneath your garden shed. Get rid of food sources. Secure trashcan lids tightly. Make sure the ground underneath fruit trees is clear of any fruit that has fallen. Also, do not leave pet food bowls outside. If you have a bird feeder, try and get one that has a seed-catcher. Secure or cover any compost piles as well. 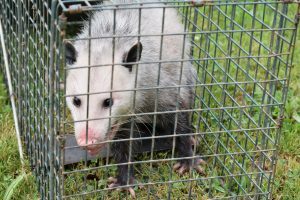 If you need help with an opossum removal, let our trained technicians at Critter Control of Miami safely and humanely capture the opossums from your property so that we may release them in an appropriate area. We will also clean any waste left in your home by the animals, as well as repair any damage they may have caused. Give us a call at 305-258-3587 or contact us online today for a free estimate.